Poly lactic acids (PLA) received greater attention among other biodegradable plastics as they exhibit higher strength, stiffness, molecular weight and biocompatibility. PLA are polymers in which the stereo chemical structures are modified by polymerizing according to different versatile and flexible applications. The increased demands for PLA resins create a promising and attractive positive impact on the global agricultural economy by being nontoxic for both human body and the environment. However, the inherent brittleness of PLA essentially hampers its wide applications frame. PLA surface modification through blending, polymerization, filler and fiber reinforcement for fabricating high end composite products perfectly overcomes its shortcomings for various purposes. Present review article is designed to be a comprehensive source of recent literature on PLA structure, synthesis, modification and its different applications. 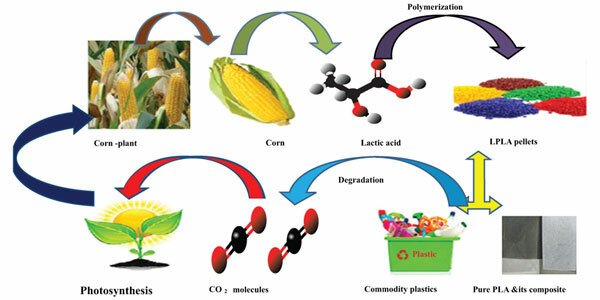 This review article also aims to cover the reported research work of PLA biocomposites and nanocomposites, including manufacturing techniques and there diverge industrial applications. Biopolymer, lactic acid, polylactic acid, natural fibers, composites, nanocomposites.